This file uses the list of quality single cells defined by the quality control analysis to filter the count matrices. It also removes lowly expressed genes and genes with invalid molecule counts (greater than the maximum allowlable 1024). Input read counts for bulk samples (in order to filter genes). Input annotation for bulk samples (for PCA plot). We performed quality control to identify low quality single cells. We filter the annotation, reads, and molecules data to only include quality single cells. The number of good quality cells is not even across batches. We filter the genes to exlude both those that are lowly expressed or over-expressed (>= 1024 molecules in a given cell). 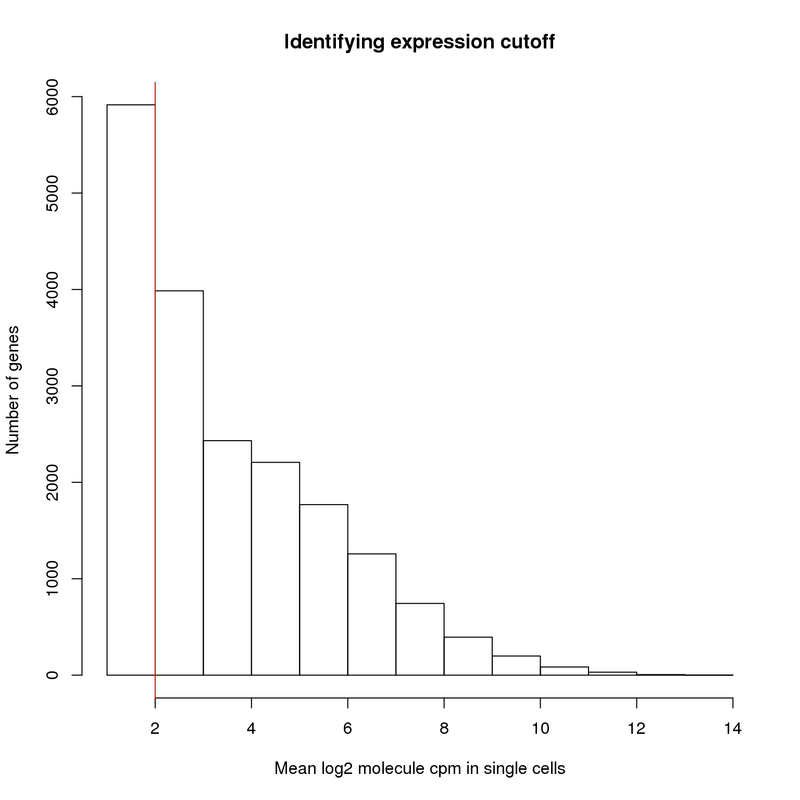 We identify the lower cutoff using the mean log2 molecule counts per million (cpm) in the 564 high quality single cells. 13112 genes have a mean log2 molecule cpm greater than 2, including 48 ERCC genes. Next we identify any genes which have greater than 1024 molecules in any given single cell. These are above our theoretical maximum number of UMIs (it can happen when a highly expressed gene as multiple start sites), and thus we cannot correct them for the collision probability. 6 genes have molecule counts greater than or equal to 1024 in at least one single cell, which includes 0 ERCC control genes. Update the list of genes passing the filters. 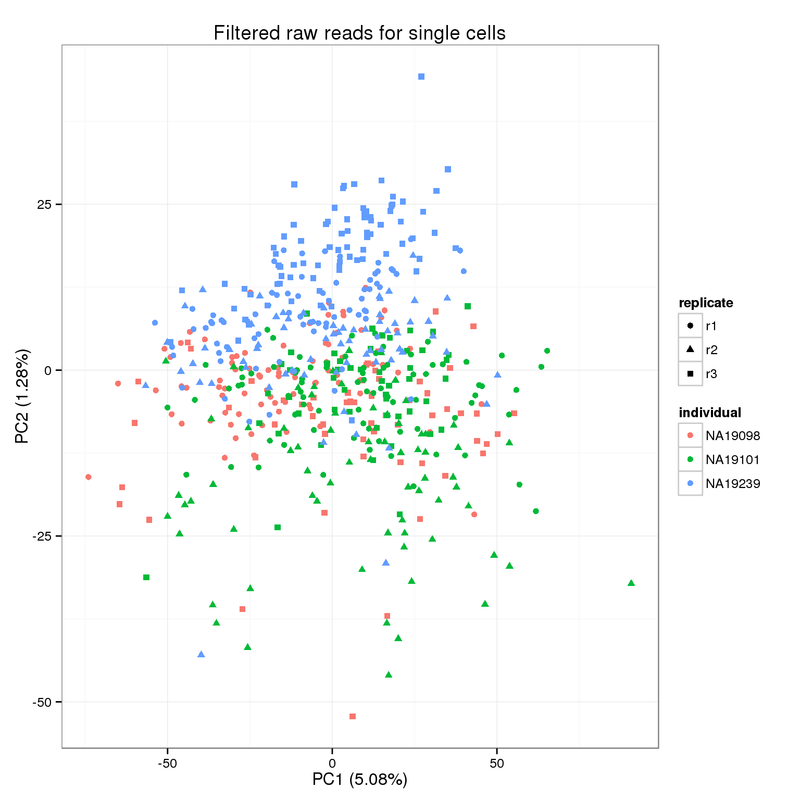 Filter the data to only include the subset of 13106 genes which pass the lower and upper expression cutoffs. This subset includes 48 ERCC genes. Output list of genes that passed filters. Because we start with the union of observed genes in the single cell or bulk samples and then the expression cutoff is based on the expresssion in the single cells, it is possible that a gene is not observed at all in the bulk samples. This causes an error with the PCA because that gene is invariant, so they are filtered before performing PCA.